I really look forward to Lori Anderson's Bead Soup Blog Parties and this 6th incarnation was no different. I marked the date for sign-ups in big pink letters on my calendar so I wouldn't forget. I really enjoy the process of these swaps. For me, there is no better way to get my juices flowing -- to wake up my muse. Speaking of my muse, she had been asleep or visiting somebody else for quite a while. I was hoping that the process of going through my entire bead stash (the first step in the BSBP) would tickle her fancy. So, back to the process, I go through my stash and find, first, the perfect strand of my handmade beads to send to my partner. (This year my partner is the lovely and talented Rossana De Gaspari.) Then match up that strand or pendant with other beads and findings from my stash to send to Rossana. The rules say to send a focal bead and clasp along with a few coordinating beads and when you receive your beads, you must use those components in your designs. 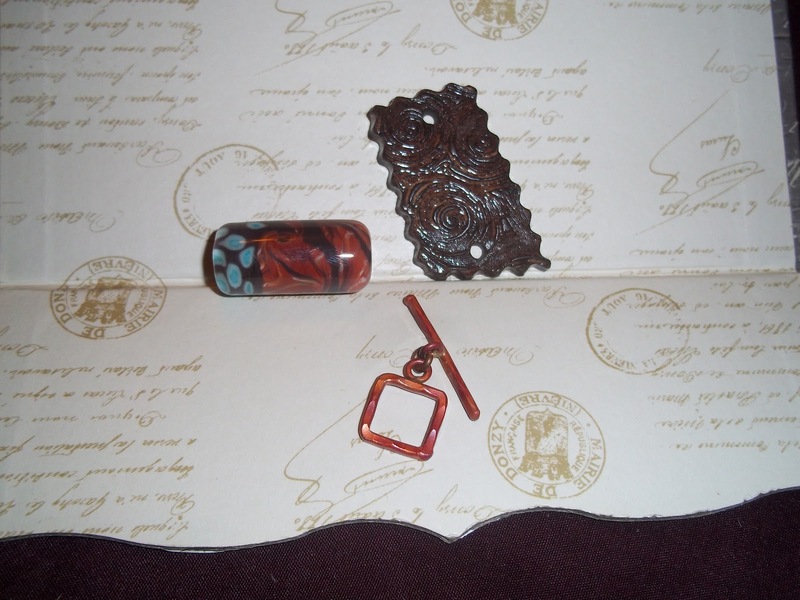 Here is a reminder of the focal pieces and one of the clasps that Rossana sent to me -- mind you she sent me an entire stash of lovely beads, strand after strand of wonderful inspiration. I usually design a neckace with the BSBP beads that I've been sent in the past. Maybe a bracelet or a pair of earrings to match, but always a necklace. Not this time. This time I was all about the bracelets. In fact, I made more than one. 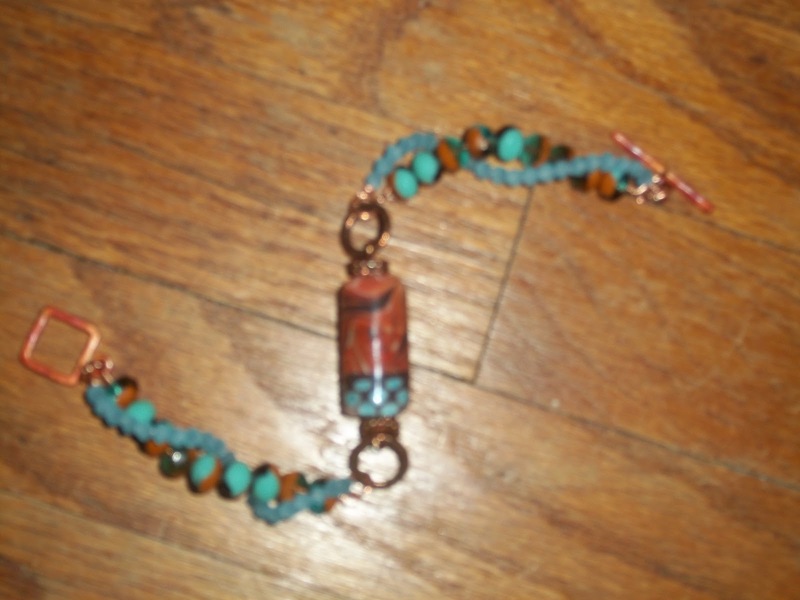 The first bracelet that I made, I used only the pretty orange stones that were in the stash box that Rossana sent. I have had that hollow glass bead, that my good friend Amy gifted to me, for years. I've been keeping it for something special. These orange stones (I'm not sure what they are, maybe some type of marble? ), fit that bill. I just did simple macrame with the leather cord from the stash box around the beads, which I wired up the center for a bit of strength. It came out great, don't you think? Next, still on the macrame kick, I used the ceramic focal, lampwork and ceramic rondelles from the stash box, along with some chocolate brown waxed linen (along in the stash box) to create this bracelet. I used a simple lobster clasp for a closure here. I wanted to make as many pieces as I could without adding much from my own stash for the reveal, today. With the huge selection that Rossana sent me, I was able to make another bracelet. I used the wonderful Glass Addictions bead from the stash as the center point. I wired it to two large jump rings from the box and then linked two wired strands of Czech glass (one from the stash box and one from my stash) that I coiled around each other then linked those to one of the clasps that were in the stash box. Last but not least, are these two pair of earrings that I made. 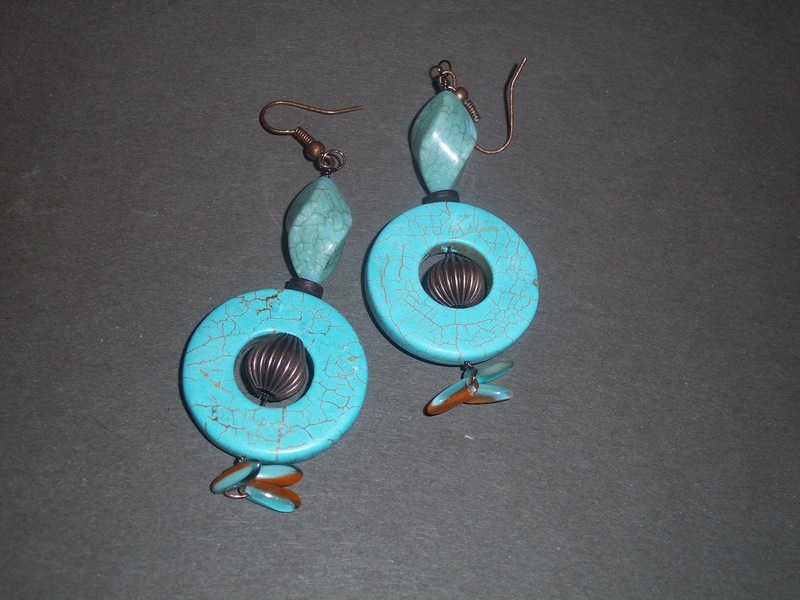 For the earrings, I'll admit to having used some beads from my own stash, the turquoise donuts in the dangling pair and the ceramic disks in the hoops. 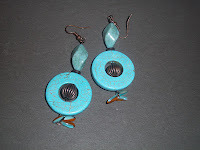 (I made three, but had a terrible time photographing the earrings. Thus, only photos of two pair. After all of these pieces, I still have enough stash left over to make many, many more pieces. 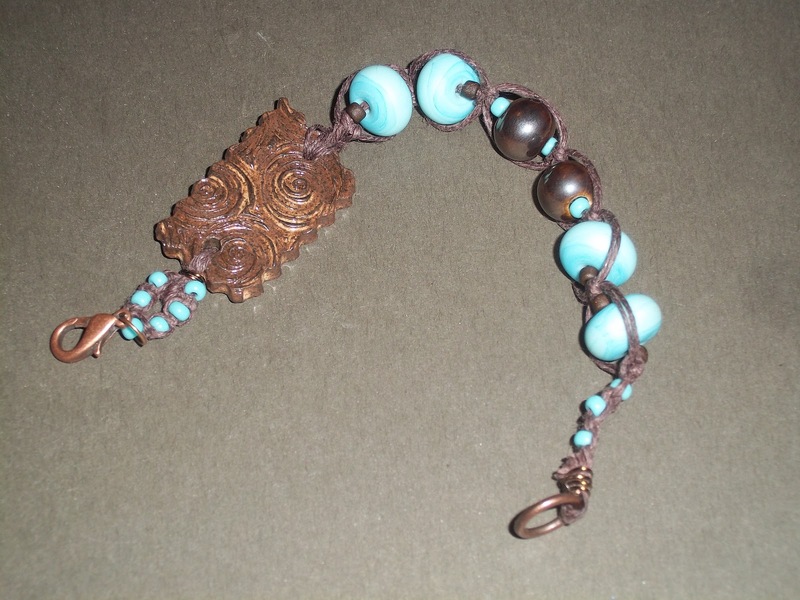 In fact, come back in the next couple of days -- I plan to post a few more of the pieces that I made, one featuring the other copper clasp from Rossana's generous stash of beads. Love, love the macramé look. 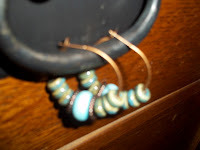 My favorite is the focal bead with the blue beads and brown macramé! Beautiful pieces. I especially love the orange bracelet. I really love that second bracelet especially! Lovely job with your soup. I always have a heck of a time making bracelets but yours turned out wonderfully. I especially love the second one which is one that I would be proud to wear. I absolutely love what you did with your bead soup!!! You made some amazing bracelets and earrings! I especially love, love, love what you did with the Glass Addictions focal bead! It has been a pleasure having you as my BSBP partner! very interesting bracelets - the macrame gives a nice texture! My favorite is the one with the ceramic focal, which is gorgeous! Love your creations and your macrame work is awesome! Nicely done! Beautiful creations! You had some nice soup and made some really lovely pieces! 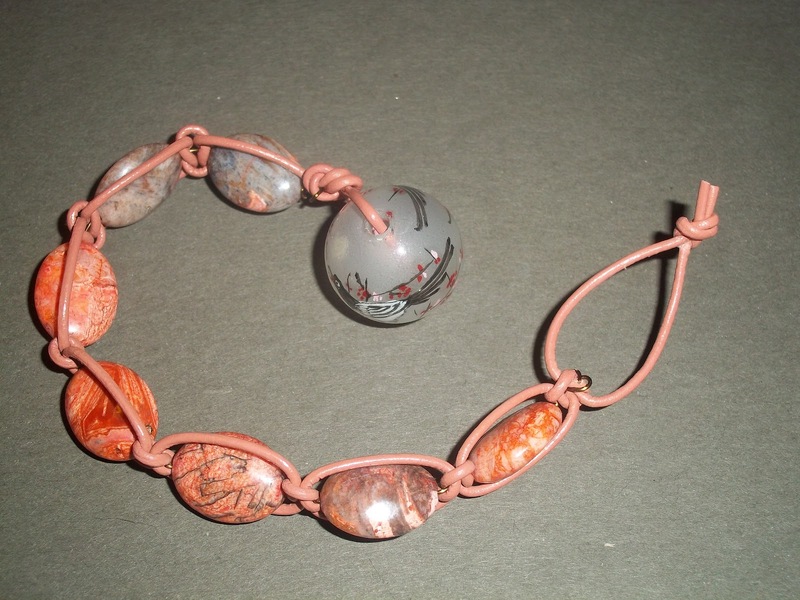 The ceramic focal, bracelet is wonderful, the macrame complements the rustic feel to this. All your pieces are lovely, but that first bracelet is my favorite. I love the simple design which lets the beauty of the stones show. And the hollow glass bead is the perfect finishing touch! very creative designs, elegant and funny! comgratulations! I'm totally addicted to your bracelets! so glad you made them! They're gprgeous!! Beautiful pieces, and I especially love bracelets!! Love the blues with the darker, rustic colors! I'm hopping around this time, not participating, and having a great time! Have a great week! Love your macrame work with beads! Beautiful creations! Love the use of macrame, it gives the pieces a bohemian look. Fantastic!! Love the bracelets and waxed linen is so much fun!!! Very pretty! I've been trying my hand at macrame myself. Lovely! Great job with your soup. I like all of your pieces. Very nice pieces. Love the macrame. Wonderful bracelets and earrings. You did a really Soup-er job with your bead soup! Love the bracelets and love the macrame. It's great how old techniques are still being used in new and creative ways. Great job! All of your pieces came out so nice! I especially like the bracelet with the ceramic focal. Very well done! What great pieces. My favorite is the second bracelet with that great ceramic focal, the waxed linen and the beads. but they're all nice. I love that you did bracelets. I am all about the bracelets too. Love the colors in the 2nd piece. Great job with your soup! the second bracelet is my favorite. you did a lovely job with your soup. well done! Beautiful bracelets, thanks for showing them! Great bracelets! I especially love the one with the ceramic focal! Pretty pieces!! Love the two turquoise bracelets! 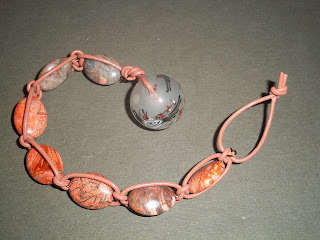 I love the bracelet that you made from the bead sent by glass addictions.